Installing the Unified Remote server without the driver may help you resolve some specific connection issues. However, this will make the remote unable to interact with elevated programs (ones that have been launched as administrator). First, uninstall Unified Remote Server if you already have it installed. Note, that you may have to restart your computer after to make sure that the driver really gets removed properly! Next, download and install the latest version of the server. Proceed with the setup wizard untill you reach the "Input Simulation" step. 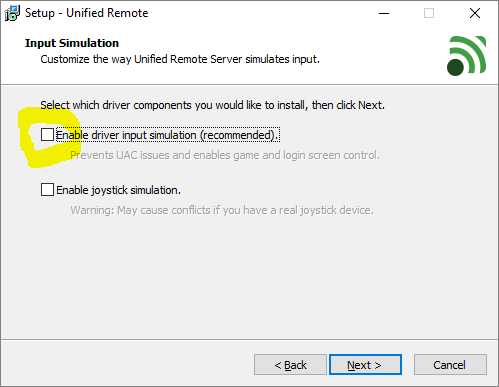 Make sure that the "Enable driver input simulation (recommended)" checkbox is NOT checked.